It’s still winter! Can you believe it’s still winter?! Not to worry, there’s still plenty of comforting soup to make it all better. And this one is a belter, if I do say so myself. It does take a little extra effort, but it’s so worth it. A stick blender and a sieve are also handy! 1. 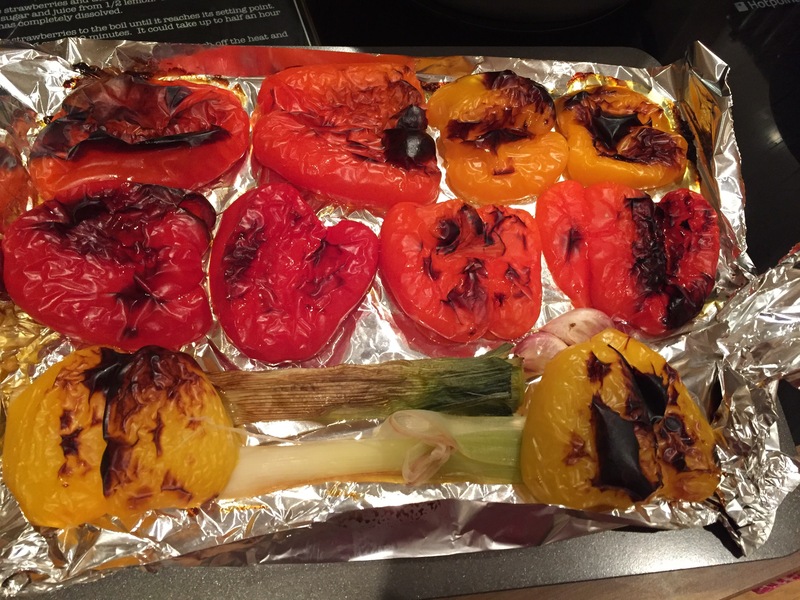 Preheat the oven to 190c and prepare three baking trays, lined with foil. 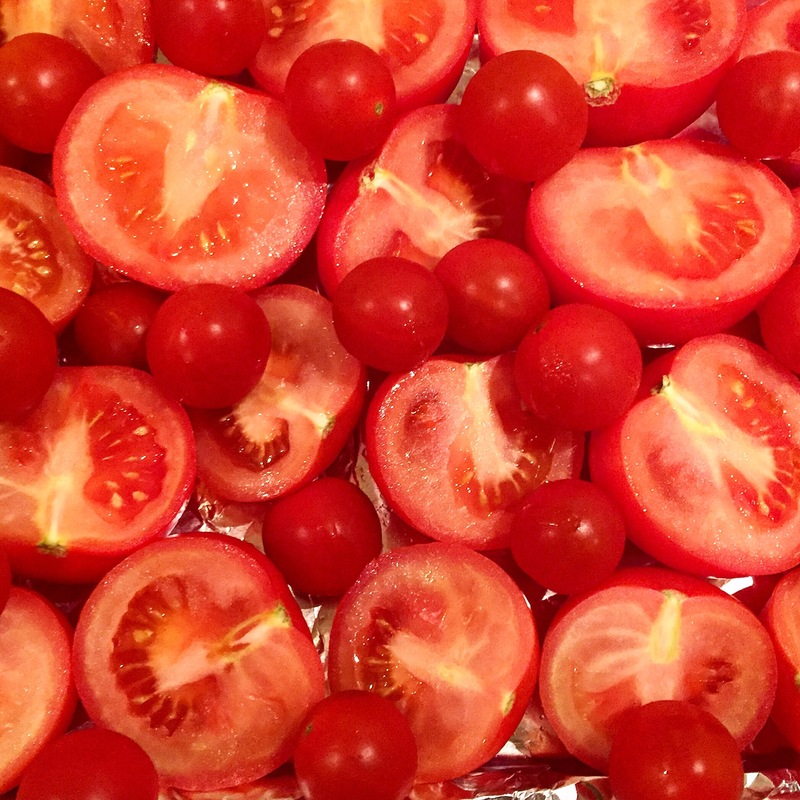 Cut each larger tomato in half and place face up on the trays, then add the cherry tomatoes in the gaps. Drizzle with olive oil and put in the oven. 2. Top and tail the leek and cut it in half lengthways. Place it cut side down on the third tray and add the garlic. Core the peppers and cut them in half, removing any seeds and so on. Place face down on the tray and drizzle with olive oil. Put in the oven on the highest shelf. 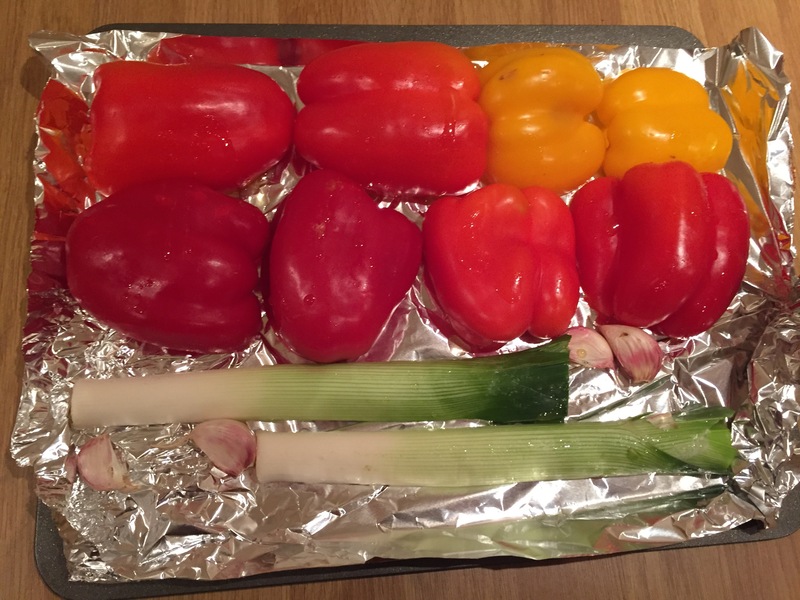 The trays will each need around half an hour to get the vegetables roasted and packed with flavour. 3. Meanwhile, chop the onion and carrots and prepare the stock. 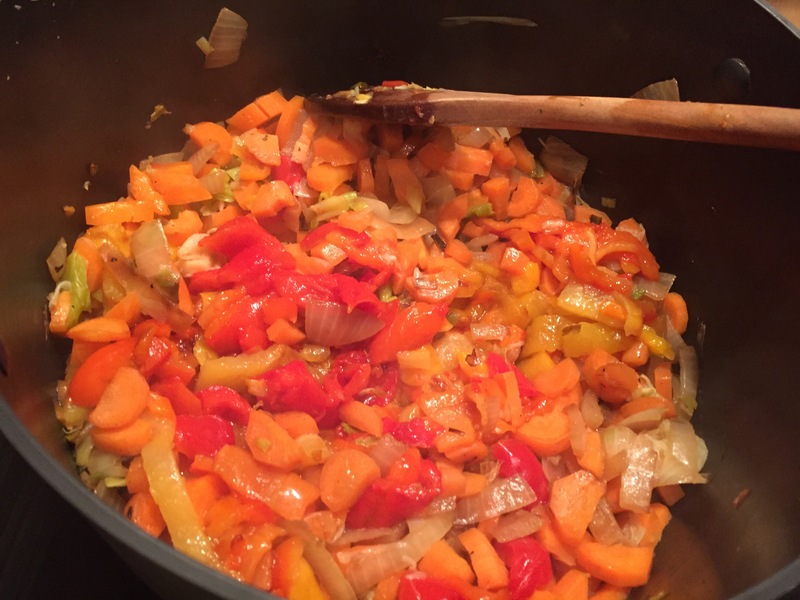 Heat a little oil in a stock pot and toss in the chopped onions. Sweat then down and add the carrot. 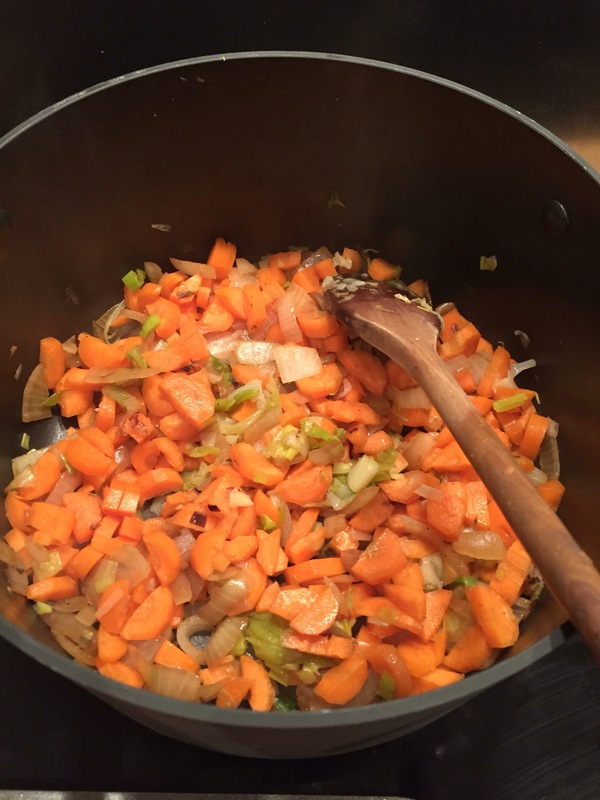 The leek can be chopped and added once it has roasted to a sweet and tender state. 4. 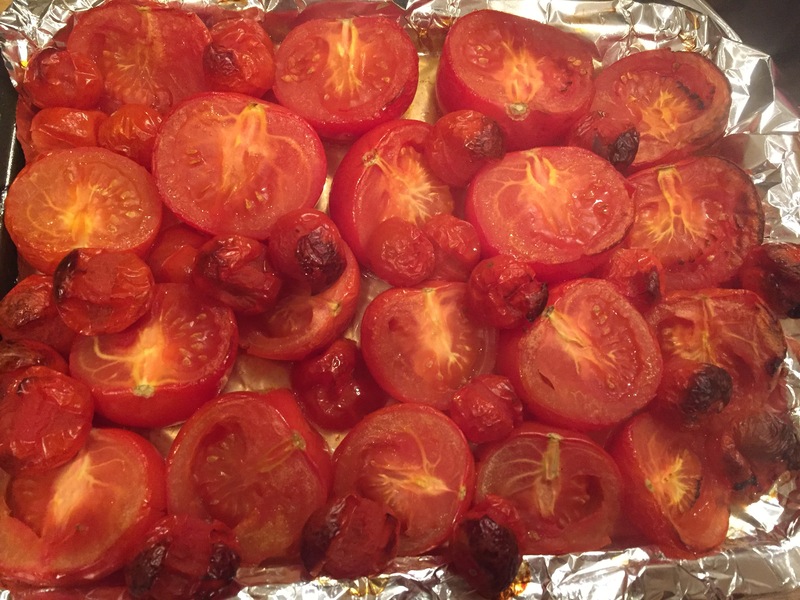 When the tomatoes are starting to catch, they’re ready and can be removed from the oven. One tray may take a little longer than the other depending which shelf it’s in but just remove each when they’re ready. 5. The pepper tray will be ready when the peppers’ skins have blackened considerably. Allow them to cool a little while you chop the leek and add it to the soup pot, then squeeze the roasted garlic out of its skin, then add to the soup pot. Allow everything to sweat down a little, but not brown. 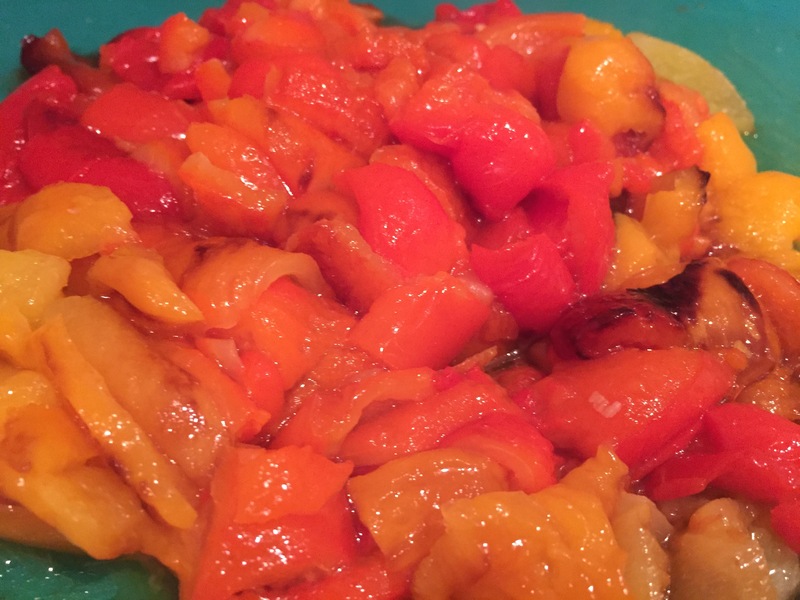 6.To get the peppers to this stage of glorious lusciousness, simply pinch the blackest part of the skins where they will have come away from the flesh and peel off the papery skins. Roughly chop them up the add to the pot and stir them into the rest of the lovely vegetables. 7. Dissolve the stock cubes in around a litre and a half of boiling water (if you haven’t done so already) then pour it into the pot. 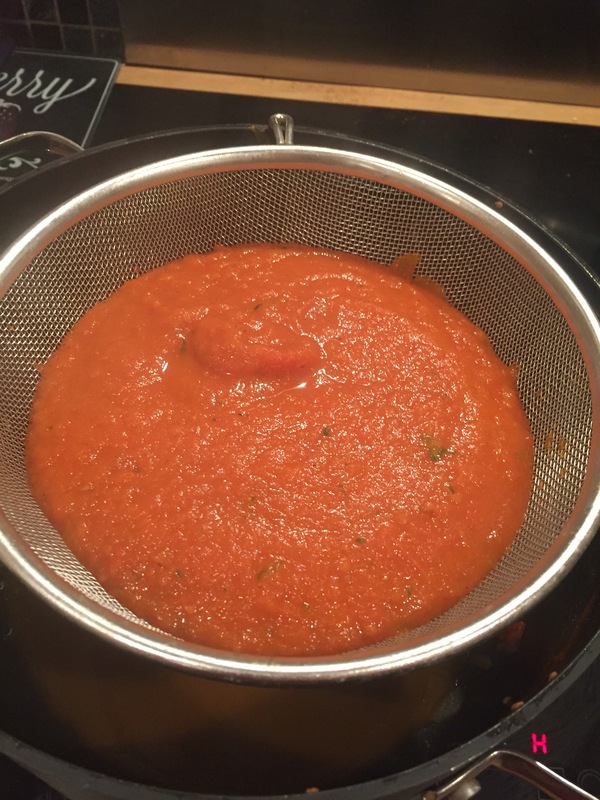 Add the tomatoes, just as they come off the tray, and pour in any tomatoey juice which has leaked into the tray. 8. Add the dried herbs and spices, liquid seasonings and a few cracks of black pepper (everything bar the fresh herbs and some last minute salt). Let everything cook out with the lid on for around half an hour. 9. Get ready to blitz! 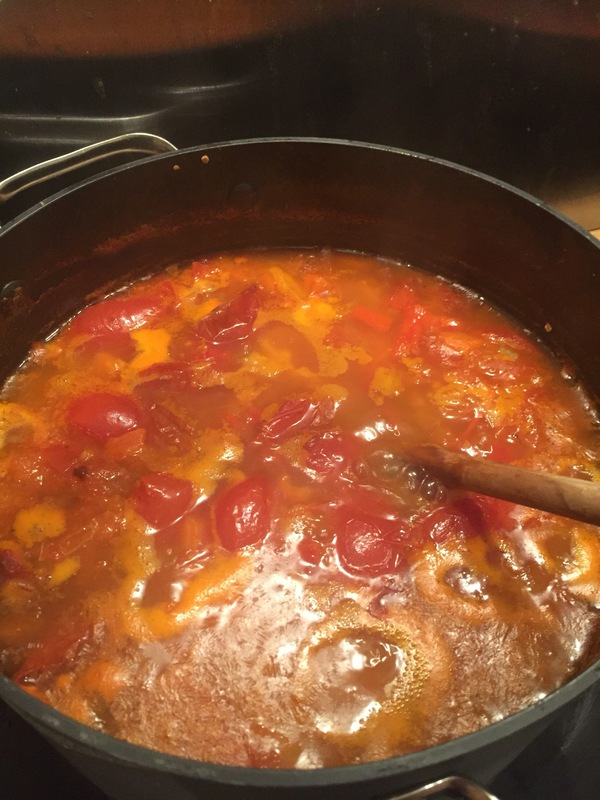 Turn off the heat and (if you have a non-stick pot you’re sensitive about like I have) decant the soup into a large bowl. Please don’t do this all at once by pouring it straight from the pot to the bowl as you’ll be in danger of scalding yourself or at least being splashed by boiling liquid. Use a ladle! 10. Add the fresh herbs and blitz with a stick blender. You could, of course, do this in a blender in batches – just be careful to put the lid on. 11. Here’s the time consuming part! 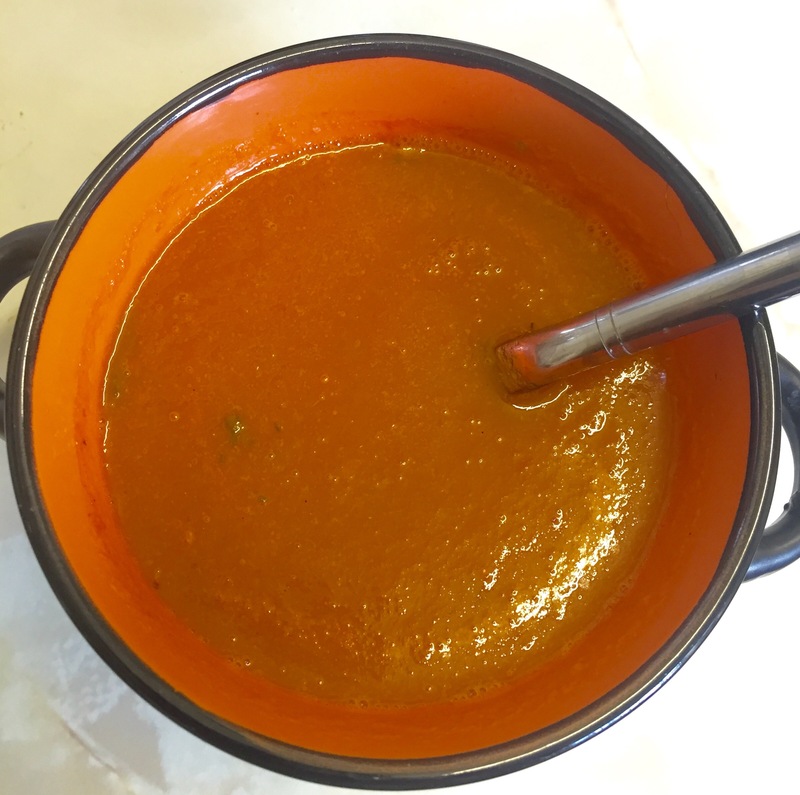 Make sure your soup pot is free of any lumps of onion and so on and place a sieve over it. This uses to take me much longer when I was using my terrible, flimsy Joseph Joseph sieve (it came in a set with bowls I’ve never used), but I invested in this sturdier sieve at TKMaxx which saves a bit of time. 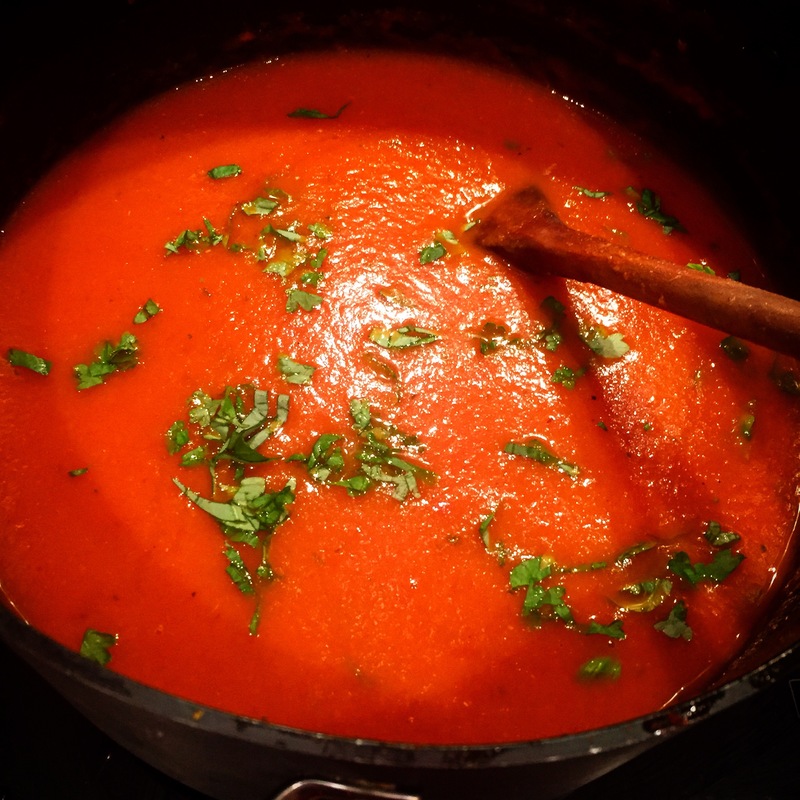 Add a few ladles at a time to the sieve and push the soup through with a wooden spoon, scraping hard to get as much through as you can, leaving the seeds and skins behind. 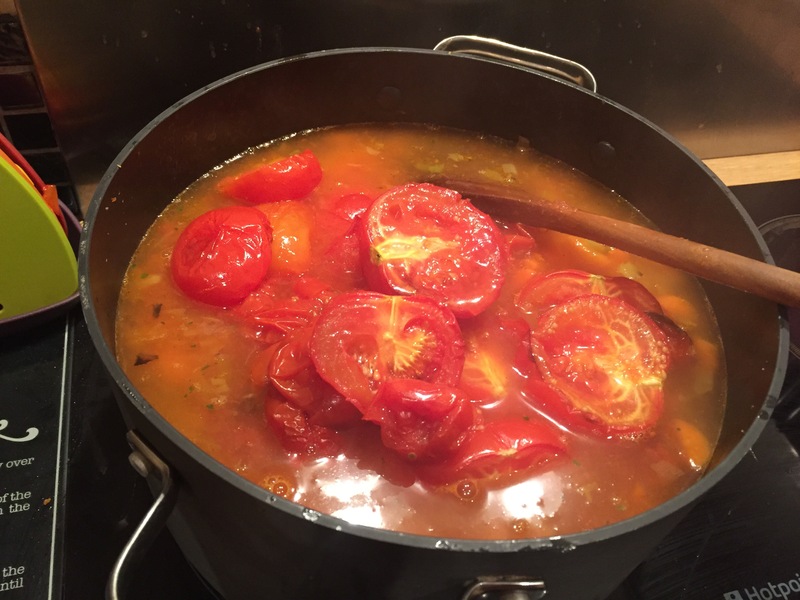 You could blanch and skin the tomatoes before they go into the oven, but I think leaving them on throughout the process really turns up the volume and colour. Repeat until it’s all sieved, and discard the pulp. Make sure you scrape the underside of the sieve clean into the soup pot, as that’s where the thickest parts tend to linger. 12. 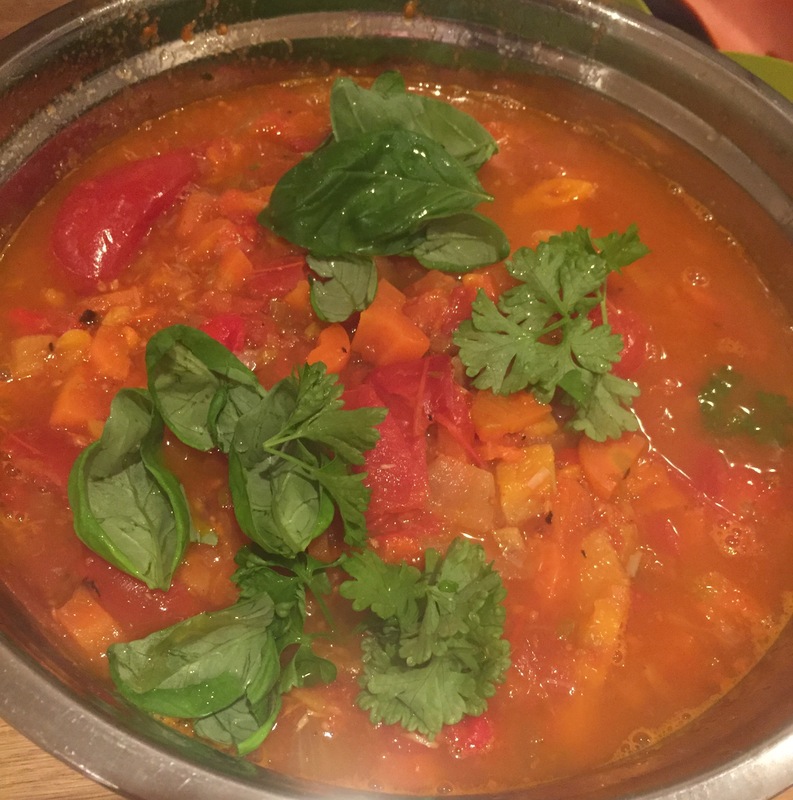 Add a few more leaves of basil and parsley, stir through and serve up or portion up for lunches and the freezer. 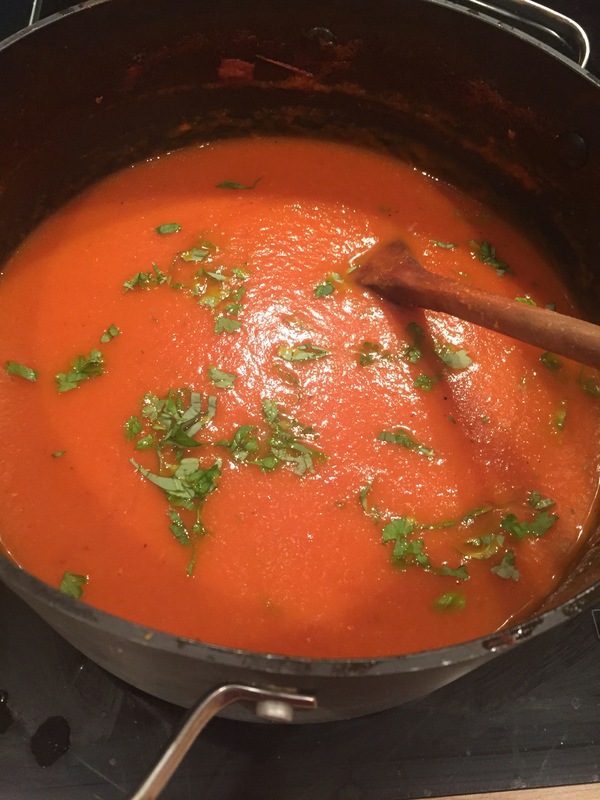 Let me know if you try this – I’ve been making soup for years and this is honestly the best I’ve managed it so far – It tastes a bit like Heinz cream of tomato but without the cream and with a bigger, fresher flavour. It’s a bowlful of vitamin C. Enjoy!